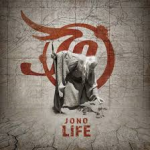 Share the post "Album review: JONO – Life"
Jono joining Frontiers will be good for both parties, as Jono will get greater exposure to their marvellous mix of pomp, rock and prog, whilst Frontiers have a band who I am sure as Mr Halford sings will keep on delivering the goods. Vocalist Johan Norrby is the main driving force behind Jono, not only as sole songwriter but also his singing – hints of Freddie Mercury, Dream Theater’s James LaBrie and a voice that you can easily imagine taking a lead role in a big production musical. To be fair his vocals do run away with the songs at times and the rest of the band play catch up. The band includes Within Temptation’s guitarist Stefan Helleblad and the keys/piano of Johan Carlgren are suitably impressive and grandiose. They have gone more down a progressive rock route on this album, with Muse coming to mind on ‘Crown’ and those vocals – wow! ‘Sailors’ rocks out nicely, one of the few uptempo songs on the album. The theatrical side of the band comes to the fore on ‘Down Side’. The vocals, piano and rhythm section are superb. Adding the full orchestra to the album’s closing song ‘The March’ really gives Jono’s music the full on pomp rock treatment. Hopefully the band will look to use orchestral arrangements in the future more. This entry was posted in ALBUM REVIEWS, ALBUM REVIEWS (Mobile), All Posts and tagged album, Jono, Life, melodic, Muse, pomp, progressive, Queen, review, rock. Bookmark the permalink.